This article is about mineral extraction. "Mining" can also refer to installing explosive devices. Mining is the extraction of valuable minerals and other geological materials from the earth, usually from an ore body, vein, or (coal) seam. Materials recovered by mining include coal, diamonds, limestone, bauxite, phosphate, rock salt, precious metals, iron, nickel, lead, tin, uranium, and molybdenum. In a broader sense, the term "mining" may also be applied to the extraction of petroleum, natural gas, and even water. Thus, mining activities around the world have provided us with a wide range of raw materials that have helped us develop technologies to enhance our quality of life. Mining has also been associated with problems related to miners' health and safety, environmental pollution and degradation, and threats to public health. Today, many countries have strict regulations to prevent these problems and to reclaim the land after the mining project is completed. Consequently, mining practices have become significantly safer and healthier. Yet, these problems persist in regions of the world where regulations are lax and clean mining technologies are unavailable. The oldest known mine in the archaeological record is "Lion Cave" in Swaziland. Radiocarbon dating indicates that this site is 43,000 years old. It is thought that paleolithic humans may have mined the area for the iron-containing mineral hematite, which they ground to produce the red pigment ochre. Sites of similar age have been found in Hungary, where Neanderthals may have mined flint for weapons and tools. Another early mining operation was the turquoise mine operated by ancient Egyptians at Wady Maghareh on the Sinai peninsula. Turquoise was also mined in pre-Columbian America, in the Cerillos mining district in New Mexico, where a mass of rock 200 feet (60 meters) deep and 300 feet (90 meters) wide was removed with stone tools. the mine dump covers 20 acres (81,000 square meters). The first use of black gun powder for mining appears to have been in a mineshaft under Banská ·tiavnica, Slovakia, in 1627. The first mining academy in the world was established in the same town in 1762. Mining in the United States became prevalent in the nineteenth century. Mining for minerals and precious metals, such as during the California gold rush in the mid 1800s, was very important in westward expansion to the Pacific coast, along with ranching and exploration of oil and gas fields. During this period, many Americans (both Caucasian and African American) traveled west by railroad for work opportunities in mining. Western cities such as Denver, Colorado, and Sacramento, California, originated as mining towns. Several steps need to be taken before a mining project can begin. Prospecting, to discover the locations of ore.
Exploration, to defining the extent and value of the ore that was located. Resource estimation, to mathematically estimate the extent and grade of the deposit. Mine planning, to evaluate the economically recoverable portion of the deposit. Conducting a feasibility study, to evaluate the total project and to decide whether or not to proceed with the project. It includes a cradle-to-grave analysis of the possible mine, from initial excavation all the way through land reclamation. Once the decision has been made to start the project, an infrastructure has to be put in place to create access to the ore body. When that is completed, the land is excavated and the ore is extracted on a large scale. Finally, a well-planned mining project ends with reclamation efforts to make the land suitable for future use. One of the most dramatic changes in the mining industry has been the role of sophisticated, three-dimensional mine planning computer software packages. Once the decision has been taken to proceed with a mine, one needs to create detailed designs that take into account the area's topography and infrastructure, as well as the physical parameters of the ore body. Manual design and old-fashioned planning methods can be tedious and face many unique challenges that depend on the nature of the mine. Initially, the 3-D software was used for relatively simple tasks, such as rendering graphic images of drill holes, which made it easier for surveyors, geologists, mine planners, mining engineers, and other technical staff to manipulate and visualize data. In recent years, however, a wide range of integrated mine planning tools have been developed so that complex models can be built to optimize the extraction and processing of mineral resources. There are two basic approaches for mining ore: surface mining, for the extraction of ores that are near the Earth's surface; and subsurface mining (or underground mining), for the extraction of ores that lie underground. Each of these can be performed by one of several techniques. 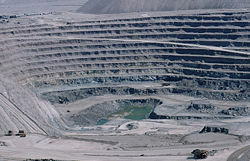 Open-pit (or open-cast) mining: It is a method of extracting rock or minerals from an open pit (or "borrow"). The mine is dug on "benches" (at three-meter or six-meter levels), corresponding to horizontal levels of the mine. Most walls of the pit are dug at an angle less than vertical and are stepped, to minimize the danger of falling rock. Quarrying: A quarry is a type of open-pit mine, but the term is generally used for extracting building materials, such as dimension stone. Quarries rarely use benches, as they are usually shallower than other types of open-pit mines. Strip mining: Similar to open-pit mining, strip mining involves removal of soil and rock (overburden) that overlies the ore.
Mountaintop removal: This process, used for coal mining, involves massive restructuring of the land to gain access to a deposit that may lie as much as one thousand feet beneath the surface. The mountain (or overburden) is clear-cut, leveled with explosives, and pushed into a nearby valley or hollow to expose the underlying coal. Drift mining: It involves accessing the desired material by making an approximately horizontal cut into a side of the earth, such as a hillside. The drift (or cut) may have a slight incline to aid in removing the material. Slope mining: In this method, a shaft is dug at a downward slope to access the material desired, such as coal. Shaft mining: This method involves drilling a mine shaft that is a vertical (or steeply inclined) passageway to an underground mine. Horizontal projections (called "drifts," "galleries," or "levels") are dug from the shaft. The workers, equipment, and minerals are raised and lowered by a "cage" (a form of elevator) operated through the shaft. Hard rock mining: This term is used for various techniques to mine ore bodies by creating underground "rooms" or stopes supported by pillars of standing rock. The ore is accessed by drilling a decline (spiral tunnel) or vertical shaft. Often a mine has a decline for personnel and machinery access, and a shaft for ore haulage. Borehole mining: This is a remotely-operated method of extracting mineral resources through boreholes, with the aid of high-pressure water jets. The process can be carried out from the surface of the land, open-pit floor, underground mine, or floating platform or ship. Miners today do more than just digging tunnels in the earth. The mining industry employs personnel ranging from engineers and lab technicians to geologists and environmental specialists. In addition, it uses the services of accountants, lawyers, sales representatives, and public relations specialists, as well as the people who manufacture the machines and equipment necessary for the project. Mining, like other heavy industries, requires heavy machinery to break and remove rocks that range in their degree of hardness and toughness. Bulldozers, drills, explosives, and trucks are important for digging into the land, especially in surface mining. Underground mining today tends to be technologically more sophisticated, because of the dangers and expense of subsurface tunneling. Although individual entrepreneurs and small businesses sometimes conduct exploration and mining, most modern-day mines are large-scale enterprises requiring huge amounts of capital. Consequently, giant companies that are often multinational and publicly owned dominate the industry. In the United States, employment in the mining industry offers highly competitive wages and benefits, especially in rural or remote areas. Yet the industry is going to find it difficult to replace the generation of miners, mine engineers, senior managers, technical experts, and others who are set to retire between 2005 and 2015. Enrollment levels in mining education programs at American colleges appear too low to meet the anticipated demand. Recent regulations, proper planning, and technological improvements have made mining substantially safer today than it was in earlier decades. For instance, to deal with the ventilation problem in underground mines, fresh air is forced through the mine in a single direction using a large fan situated aboveground. 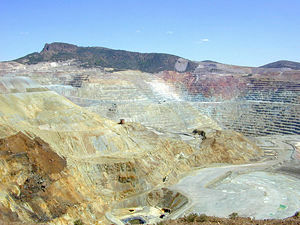 In the United States, mining is regulated under the federal Mine Safety and Health Act. The regulations are enforced by the Department of Labor's Mine Safety and Health Administration (MSHA), which employs nearly one safety inspector for every four coal mines. Underground coal mines are thoroughly inspected at least four times annually by MSHA inspectors. In addition, miners can report violations and request additional inspections, without fear of losing their jobs for doing so. The death of an individual at a mine. An injury that has reasonable potential to cause death. Entrapment of an individual for more than 30 minutes. 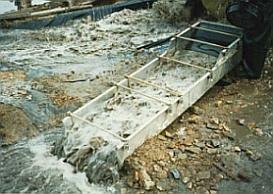 An unplanned inundation of a mine by a liquid or gas. An unplanned ignition or explosion of gas or dust. An unplanned fire not extinguished within 30 minutes of discovery. An unplanned ignition or explosion of a blasting agent or explosive. A roof or rib falls unexpectedly in active working areas, impairing ventilation or impeding passage. A coal or rock outburst that causes withdrawal of miners or disrupts regular mining activity for more than one hour. An unstable condition at an impoundment, refuse pile, or culm bank, requiring emergency action to prevent failure, or causing individuals to evacuate an area; or failure of an impoundment, refuse pile, or culm bank. Damage to hoisting equipment in a shaft or slope, endangering an individual or interfering with use of the equipment for more than 30 minutes. Statistical analyses by the MSHA show that between 1990 and 2004, the industry cut the rate of injuries (a measure comparing the rate of incidents to overall number of employees or hours worked) by more than half and fatalities by two-thirds, following three prior decades of steady improvement. Environmental problems associated with mining include erosion, formation of sinkholes, chemical contamination of surface waters and groundwater, and loss of biodiversity. 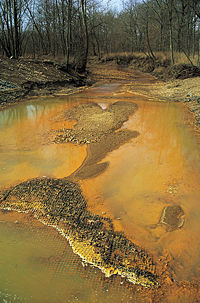 For example, coal mining releases approximately 20 toxic chemicals, of which 85 percent are said to be managed on site. If even some of these chemicals leach out with water coursing through the mine, the contamination spreads. Some specific examples of contaminated sites are as follows. Ashio Copper Mine in Ashio, Japan: It was the site of substantial pollution at end of the nineteenth century. Berkeley Lake: An abandoned pit mine in Butte, Montana, it became filled with water that turned acidic and poisonous. A water treatment plant installed in 2003 has been treating "new" water entering the pit and reducing the rate of rise of pit water. Eventually, water in the pit itself will be treated. Britannia Mines: This abandoned copper mine near Vancouver, British Columbia, has been releasing copper into Howe Sound, polluting the water and killing animal life. After the installation of a water treatment plant, fish have been returning to Britannia Bay—perhaps for the first time in recorded history. Scouriotissa: An abandoned copper mine in Cyprus, it is a source of contaminated dust. Tar Creek: An abandoned mining area in Picher, Oklahoma, it is now an EPA (Environmental Protection Agency) "superfund" site. Water has leaked out of the mine and into local groundwater, contaminating it with metals such as lead and cadmium. In many countries today, mining companies are required to follow strict environmental and rehabilitation codes, to ensure that appropriate measures are taken to protect the environment during the mining process, and that, once the mining operation is completed, the area is returned to a state similar to or better than its condition before the project was begun. These regulations, along with the technologies used to implement them, have led to significantly healthier mining practices. Yet in parts of the world where environmental regulations are lax and clean mining technologies are not available, the environment and public health continue to suffer. To protect surface waters and groundwater from contamination, including acid mine drainage (AMD), water quality is continuously monitored near the mines. The five principal technologies used to control water flow at mine sites are: diversion systems, containment ponds, groundwater pumping systems, subsurface drainage systems, and subsurface barriers. In the case of AMD, contaminated water is usually pumped to a treatment facility that neutralizes the contaminants. In the United States, mining practices are subject to close scrutiny and have improved significantly. To ensure completion of land reclamation, the Office of Surface Mining requires that mining companies post a bond to be held in escrow until the productivity of reclaimed land has been demonstrated convincingly. Since 1978, the mining industry has reclaimed more than two million acres (8,000 square kilometers) of land. This reclaimed land has renewed vegetation and wildlife and can even be used for farming and ranching. 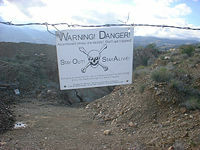 This danger sign at an old Arizona mine warns, "Stay Out! Stay Alive!" According to some estimates, there are between 700,000 and 800,000 abandoned mines in the United States. Many of them are in the vicinity of abandoned towns, often referred to as "ghost towns." Experts strongly warn against entering or exploring old or abandoned mines. It is estimated that approximately 25 percent of the abandoned mine lands (AML sites) pose physical safety hazards, because they may harbor deadly gases, snakes, and other dangerous animals. The entrance to an old mine, in particular, can be very dangerous, as weather may have eroded the soil or rock surrounding the entrance. Every year, dozens of people are injured or killed in recreational accidents at mine sites. In 1999, MSHA launched a national public awareness campaign called "Stay Out – Stay Alive." It is aimed at warning and educating children and adults about the dangers of exploring and playing on active and abandoned mine sites. The Abandoned Mine Land Initiative, launched by the Western Governors Association and the National Mining Association, is an effort focusing on reporting the number of high-priority AML sites and to identify, measure, and report on the progress of current reclamation cleanup programs on an annual basis.